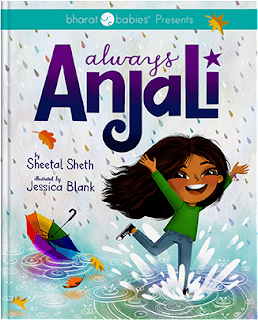 Heise Reads & Recommends: Get to Know Bharat Babies + a Giveaway! Get to Know Bharat Babies + a Giveaway! I am constantly looking for the recommendations I give and the books I share with students and educators to be culturally and racially inclusive. So I was thrilled to discover a new publisher when they reached out to ask if I'd be interested in a copy of one of their picture books to review. Bharat Babies is an indie publishing house that helps parents diversify their libraries one story at a time though children's books, magazines, and digital media. In the Spring of 2013, Sailaja Joshi was on a mission to complete her baby registry in preparation for the arrival of her first child. Inline with her “library” themed baby shower, Sailaja went on the hunt to find books about Indian culture that should could share with her newborn daughter. Of the few books that spoke to her Indian heritage, Sailaja realized that none of these books took into account the developmental needs of her growing child. Recognizing this gap in children’s literature, the idea for Bharat Babies was born. The mission of Bharat Babies is simple: design and produce developmentally appropriate books that tell the stories of India’s heritage for children from birth through elementary school. I loved Always Anjali and have recommended it often in my #classroombookaday presentations this year. It has always seemed a bit more difficult to find the stories featuring Indian characters and culture, but Bharat Babies is making it easier. 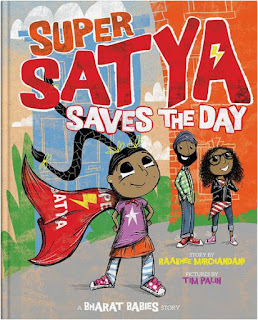 I also got to read their newest picture book, Super Satya Saves the Day, which I can't wait to read aloud to students. ALWAYS ANJALI When Anjali finally gets the bike of her dreams on her birthday, she and her two best friends are excited to get matching license plates with their names on it. But Anjali can’t find her name. There’s Amy, Betsy, Chris, and many more, but no Anjali. To make matters worse, she gets bullied for her different name, and is so upset she demands to change it. When her parents refuse and she is forced to take matters into her own hands, she winds up learning to celebrate who she is and carry her name with pride. A timeless story about appreciating what makes us special and honoring our differences. SUPER SATYA SAVES THE DAY Super Satya is ready to have a super day, including finally conquering the tallest slide in Hoboken. But her day takes a not-so-super turn when she realizes her superhero cape is stuck at the dry cleaner. Will she be able to face her fears, help her friends and be the true hero everyone knows she is? Super Satya Saves The Day introduces Satya, a precocious Indian-American superhero.